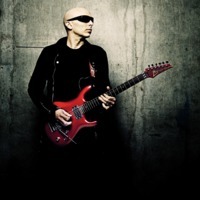 Joseph "Joe" Satriani (born July 15, 1956 in Westbury, New York) is an American instrumental rock guitarist and multi-instrumentalist, with multiple Grammy Award nominations. Early in his career, Satriani worked as a guitar instructor, and some of his former students have achieved fame with their guitar skills (Steve Vai, Larry LaLonde, Kirk Hammett, Andy Timmons, Charlie Hunter, Kevin Cadogan, Alex Skolnick). Satriani has been a driving force in the music credited to other musicians throughout his career, as a founder of the ever-changing touring trio, G3, as well as performing in various positions with other musicians. In 1988, Satriani was recruited by Mick Jagger as lead guitarist for Jagger's first solo tour. Later, in 1994, Satriani was the lead guitarist for Deep Purple. Satriani worked with a range of guitarists from several musical genres, including Steve Vai, John Petrucci, Eric Johnson, Larry LaLonde, Yngwie Malmsteen, Brian May, Patrick Rondat, Andy Timmons, Paul Gilbert, Adrian Legg, and Robert Fripp through the annual G3 Jam Concerts. He is currently the lead guitarist for the supergroup Chickenfoot. He is heavily influenced by blues-rock guitar icons such as Jimi Hendrix, Eric Clapton, Jimmy Page, Ritchie Blackmore and Jeff Beck, but possesses his own easily recognizable style. Since 1988, Satriani has been using his own signature guitar, the Ibanez JS Series, which is widely sold in stores. He has a signature series amplifier, the Peavey JSX, signature VOX amPlug headphone amp, and signature VOX pedals The "Satchurator" distortion pedal, The "Time Machine" delay pedal, The "Big Bad Wah" wah pedal and The "Ice 9" overdrive pedal.